Eclipse foundation is having one sub project for Internet of things initiatives. Kura is a set of Java and OSGi services that are most commonly required for IoT gateways, including I/O services, Data Services, Cloud Services, Networking, etc. Mihini, written in the Lua scripting language, provides low-level connectivity management to ensure that a reliable network connection is available, acts as an abstraction layer for underlying hardware and enables smart business data transmission between devices and servers, including the ability to consolidate data locally and use bandwidth-efficient communication protocols. Eclipse SCADA is a way to connect different industrial devices to a common communication system and post-process as well as visualize the data to operating personnel. Message Queuing Telemetry Transport (MQTT) is a protocol designed to connect the physical world devices and networks, with applications and middleware used in IT and Web development, making it an ideal connectivity protocol for IoT and M2M. OMA-DM is a standard communication protocol widely used in the telecommunications industry to monitor and synchronize the state of communications devices such as mobile phones or the kind of radio modules that can be found in M2M solutions. There is a nice introduction to OMA-DM on the developerWorks website. Lua Development Tools provides a IDE for the Lua programming language. Lua is an embedded programming language. Hadoop 2.3 has two new features. 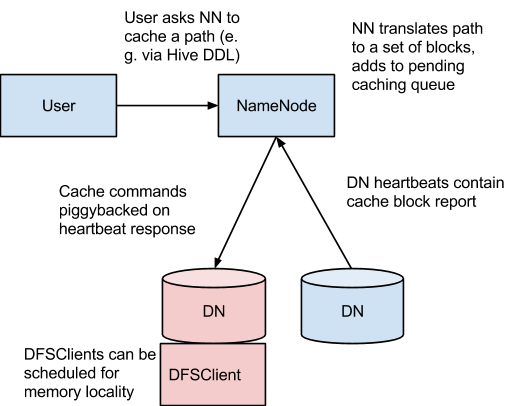 This post is related to Centralized cache management feature in HDFS. It allows you to say at start of your job to cache a particular folder into memory. Applications like Hive , Impala will be able to read data directly from memory which has been cached. The current features are SCR ( Short Circuit reads ) which allows SCR aware applications directly read from disk by passing Datanode. Comparing with current implementation Spark model , RDD is still superior as it maintains lineage both transformations of writes happening in the in memory data. It means that Spark can write intermediate data to RAM and work faster. The current HDFS cache management feature does only boosts performance with reads. So I guess still few mode improvements are needed for Hadoop to beat Spark in performance. I am very excited to see how downstream systems like Pig , Hive and Impala will use this feature to make them process things faster. I am sure things will get better and better in Hadoop in coming few releases. It’s amazing to see how various things are coming along to make Internet of Things reality for future. The efforts by Semantic web people , RFID based tracking , the work of xively for connected devices all are awesome. Today’s post is related to work done by Wolfram language project. I saw the short demo which has been released by them and highly recommend if you have not seen it. The language has wide range of already prebuilt functions and algorithms based on real world usage. With various APIs ( e.g Xively , Wolfram ) trying to do solve the problem of connected devices , I future we will see bridge between various systems which come up to help cross pollination happen. Although it’s just a preliminary release and general release announcement is pending. Copy paste the syntax you learn over this website and try out various things. 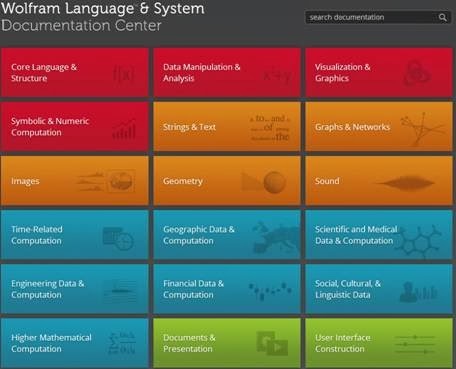 I would wish that Wolfram people make this open source for faster innovation and wider community acceptance. Just make sure that you have selected the correct Version of OS while creating Virtual machine. Before that some quick simple summary how it works. The Linux drivers are part of the upstream Linux kernel. But some devices needs additional firmware to tell kernel what device is all about and how to operate it. A additional shortcut you can follow is just download Trusty (14.04) deb file and install it. The trusty already has the firmware for it. Some of the basic concepts for learning functional programming. I noted all of them from wikipedia. In many programming languages, map is the name of a higher-order function that applies a given function to each element of a list, returning a list of results. It is often called apply-to-all when considered in functional form. This is an example of functoriality. Then calling map square [1,2,3,4,5] will return [1,4,9,16,25], as map will go through the list and apply the function square to each element. In functional programming, filter is a higher-order function that processes a data structure (typically a list) in some order to produce a new data structure containing exactly those elements of the original data structure for which a given predicate returns the boolean value true. A fundamental distinction in scoping is what "part of a program" means – whether name resolution depends on the location in the source code (lexical scope, static scope, which depends on the lexical context) or depends on the program state when the name is encountered (dynamic scope, which depends on the execution context or calling context). Lexical resolution can be determined at compile time, and is also known as early binding, while dynamic resolution can in general only be determined at run time, and thus is known as late binding. A list comprehension is a syntactic construct available in some programming languages for creating a list based on existing lists. It follows the form of the mathematical set-builder notation (set comprehension) as distinct from the use of map and filter functions. A < symbol connects the command’s STDIN to the contents of an existing file. To redirect both STDOUT and STDERR to the same place, use the >& symbol. To redirect STDERR only, use 2>. sends nothing to the terminal window. How to execute command conditionally on success of command. || echo "Did NOT make backup"
command fails (produces a nonzero exit status).